Our own van should have been ready for us to collect today but, true to form, it's been delayed yet again, this time for another 3 weeks - that'll be 4 months later than the original completion date! But that's another story. So we had nothing planned for this weekend. Cathy was working down at the unit, preparing a couple of motorhomes to go out and once again, Dave & Lesley kindly suggested we take one of their vans away for the weekend, in this case th Eldiss. So I was surprised to receive a text at work just before midday to say we're off in a van tonight so find us somewhere to stay. I popped into Morrisons at lunchtime to buy some food and was home by about 1715. Cathy was still down at the unit, but had packed some clothes: I added mine to the bag, grabbed a few other things and drove down to the unit. Because it was such short notice I knew it would be difficult to get a campsite pitch, so had a think about where to stay. I decided on the Little Roodee coach park, by the river Dee in Chester for tonight, followed by a night overlooking the beach at Lligwy Bay on Anglesey. So with the van packed up we headed off. It was a really warm day so we were looking forward to a stroll through Chester and a night out. We arrived at an almost empty car park and paid the overnight parking fee - £5 for large vans, but only £1.50 if you can fit in a normal parking bay. The van looked quite lonely parked on its own, but a couple of others arrived later. A quick change and we headed off, walking alongside the river and up into town. 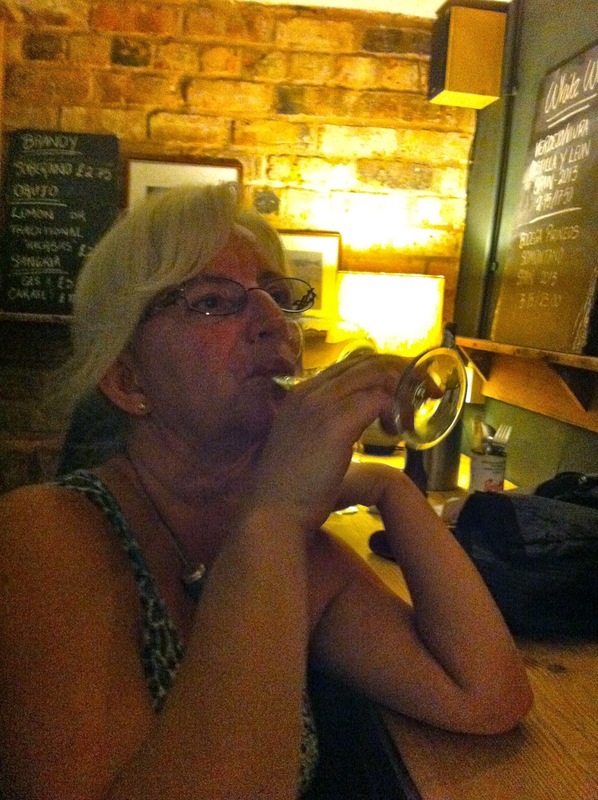 We were headed for the Portas Tapas Bar on Northgate Street, but stopped off for a couple of drinks along the way. 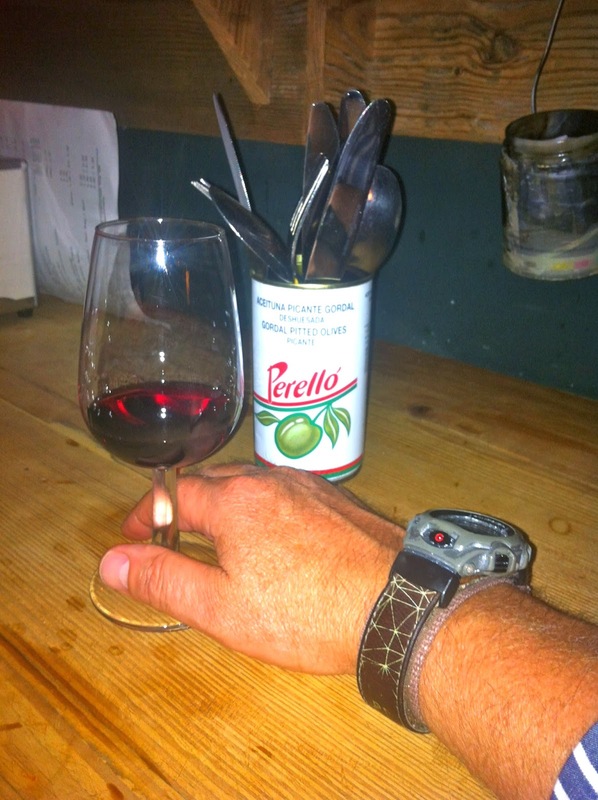 Arriving at Portas, the outside seats were taken, given the warm, balmy evening, so we went inside. They were busy so we grabbed a couple of stools near the entrance and ordered a glass of wine until a table became free. Once showed to a space to sit and eat - a couple of stools alongside a long bar-like table, we ordered our food. It quickly came and we really enjoyed it, particularly the croquetas and calamari, but it was all delicious, quickly delivered and just enough. A couple of wine glass refills later, Cathy was ready for some pudding, a lovely chocolate pudding, which came with a dark, sweet sherry. 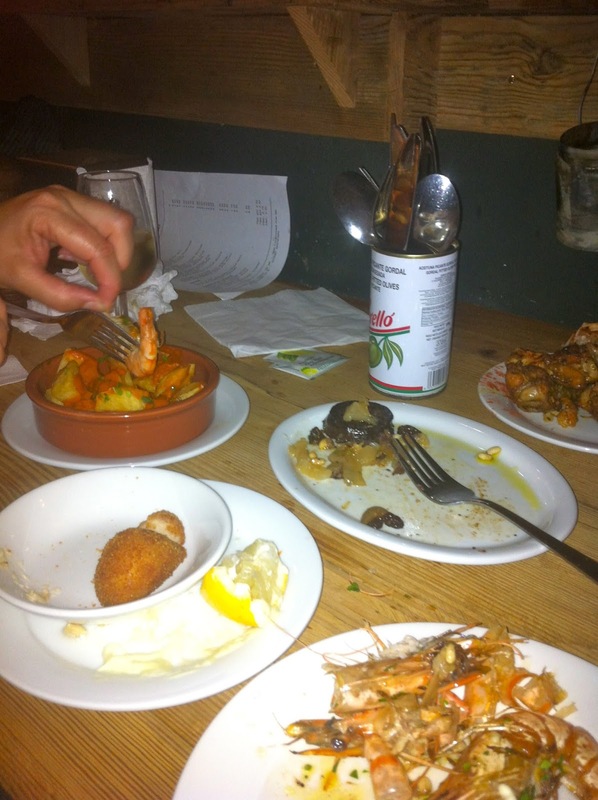 We'll definitely visit this tiny Tapas Bar again. The night was still and warm as we walked back to the van and sleep. 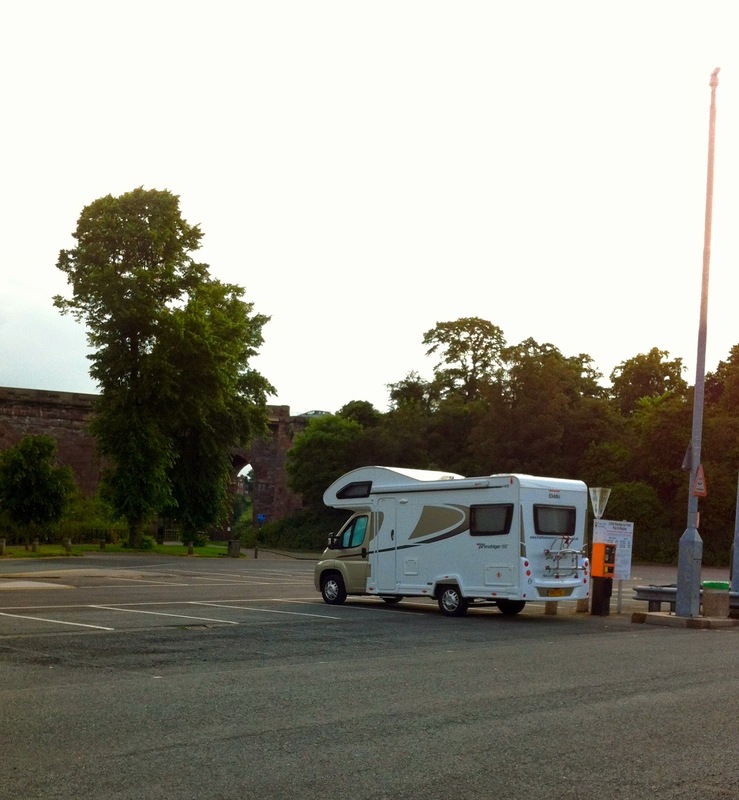 The coach park is a great option to stay overnight in Chester, if a little noisy. The gates are locked at 2230 and are supposed to be opened at 0630, but I heard the van arrive to unlock at 0430. We were up at about 0700 and had a quick brew before heading off. By this time the clouds were building and, as we joined the A55 and headed into Wales, we drove into torrential rain. By the time we reached Anglesey it had eased off and we pulled into the car park at Lligwy Bay under cloudy but warm skies. 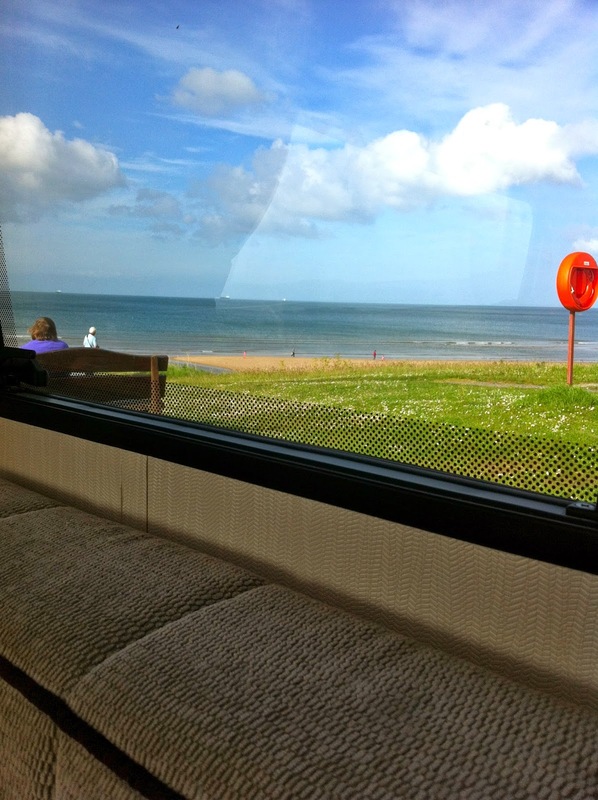 I reversed the van up to give us uninterrupted views of the bay and the sea. Kettle on, we sat in the rear lounge with some bacon butties and a brew. After a walk along the beach and a quick paddle (the sea was bloody freezing!) we came back to put our feet up, read and watch the weather. More heavy rain came over and we were both feeling tired, so I climbed into the over-cab bed, while Cathy stretched out in the rear lounge. A good snooze later, the rain and clouds were gone and the sun was shining, so we headed off for a walk along the coastal path, heading North. After a short while we realised we'd been here before - we were on the same path we had walked a few years ago, recorded in our first ever blog entry. We sat on the rocks in the sun for a while before walking back along the beach. Back at the van we had a brew sat on the bench outside, overlooking the van, before heading back inside for a read. Dinner tonight was steak, sausages and Greek salad, with a chilled bottle of Cava. 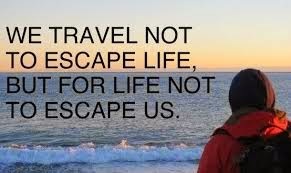 We know we won't be able to do afford to do this in our own van every weekend, but this trip was a surprise, so,why not! I'd packed our little yellow bucket BBQ so that was flashed up while we sat outside in the evening sunshine. 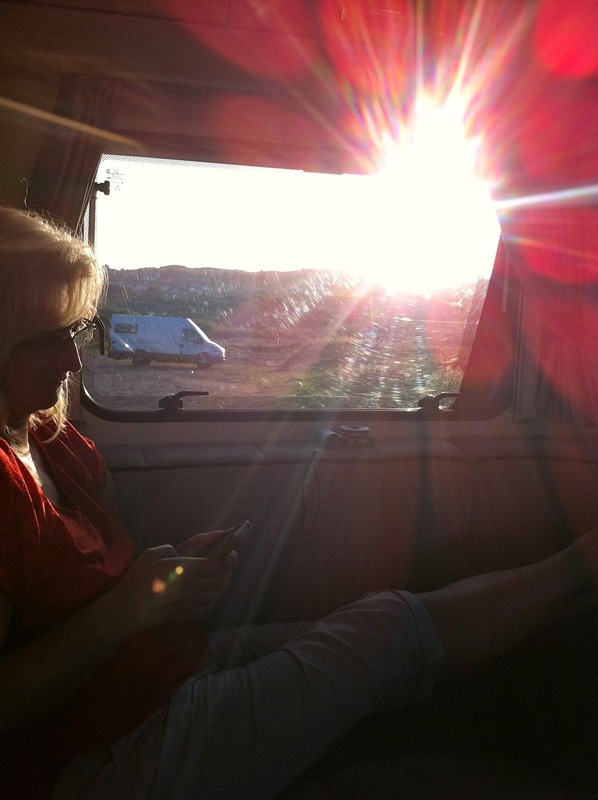 We chatted to the couple next door, in a panel van conversion, from Warrington. They were very well organised and enjoyed their BBQ, sat inside with the sliding door open and in full sun, yet out of the wind - that'll be us soon. Well fed, we sat in the sun as it lowered, headed inside to wash up, sweep the floors, then watched the tide ebb as the sun set. It's been a very relaxing day, just what we needed. As the sun sets over the headland I know we'll sleep well. We did indeed sleep well in the peace and quiet of the Bay. After a brew sat outside and a hot shower, I cooked us bacon butties. After 24 hours parked up, we packed everything away and headed off along the coastal road. Next stop was Church Bay, down a winding and narrow road. 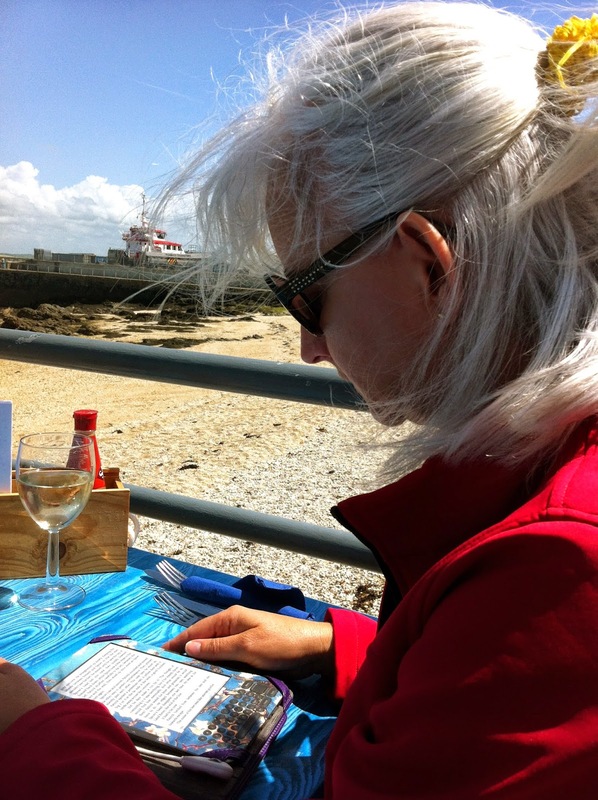 We parked up easily opposite the Lobster Pot restaurant and took a walk along the coastal path heading south. It was sunny but very blustery and we enjoyed the cobwebs being blown away as we walked along the cliff top path. From this highpoint we were looking out towards Holyhead, a few miles across the bay. We'd not been there before and it was approaching lunchtime, so that was our next destination. We followed the signs for the town centre and then the harbour. Some free coach parking was right on the waterfront so we stopped there. We started to walk into town, but it didn't look promising, so we turned back towards the harbour and popped in to check out the Harbourside Bistro. 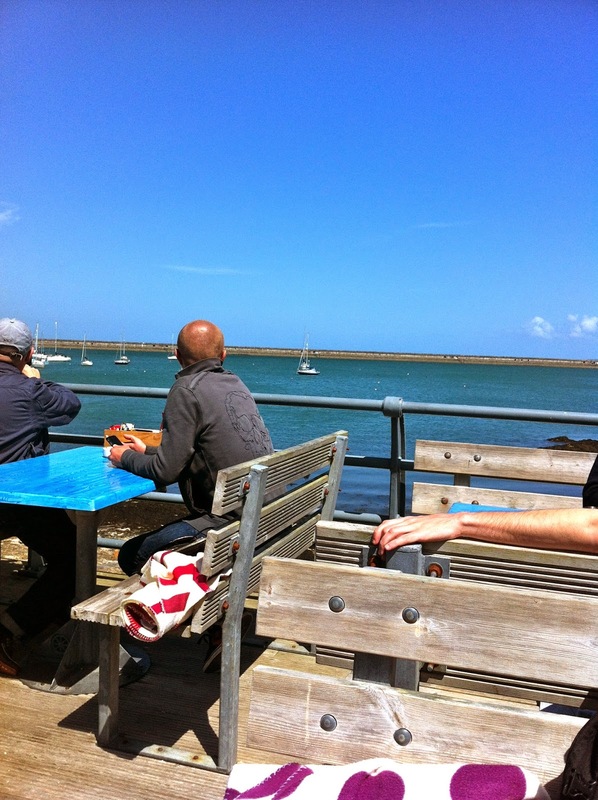 We were pleasantly surprised, outside seating on a deck overlooking the harbour, with a fresh and modern menu. Cathy had goat’s cheese and fig parcels to start and I had the fish chowder. Both were excellent. For main we both had the pan fried hake. This was cooked to perfection and came with some colourful steamed and glazed peppers, sweet potato, leek and parsnip, mushy peas, homemade tartar sauce and chunky chips. The presentation and flavour was very reminiscent of the sorts of bistros found in small French fishing harbours: a real surprise and somewhere to return. Back on the road, the plan was to find somewhere to park up, make a brew and relax for a while before driving home. But some dodgy road signs meant we instead spent a couple of hours driving across Anglesey down narrow country lanes! Ending up back on the A55, we instead pulled off toward the NT Penrhyn Castle. 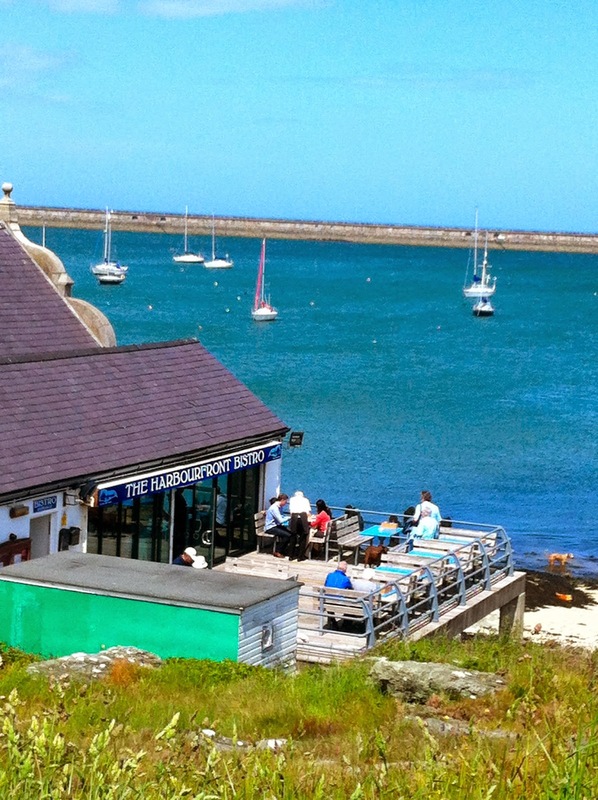 We'd visited here the last time we were in Anglesey and knew it had quiet and plentiful parking. Parked amongst the trees, Cathy made us a brew while I caught up with the blog. Then it was back on the road to get back to the unit, unpack and clean the van. Considering we were expecting a weekend stuck at home, this was a surprisingly relaxing weekend, just what we needed. 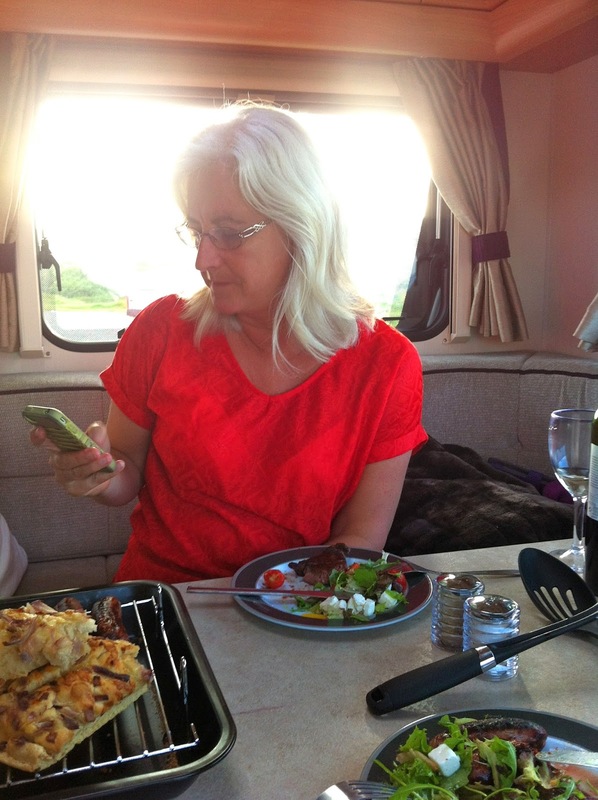 Thanks again Dave and Lesley for letting us take the Elddis - we had a great time and still love motorhoming!